This past semester, third graders in Ms. Moore’s classroom (in Oklahoma City Public Schools) wrote and published an original book titled, “Our Favorite Books.” They used an iPad Mini and the wonderful app, “Book Creator” by Red Jumper to include photographs of their artwork, their written text, and audio recordings of their voices reading each section of the book. The book is available as an enhanced ePUB ebook, a PDF (without audio), a printed color paperback on Lulu.com, and as a YouTube screencast. All these versions are linked on ebooks.playingwithmedia.com/moore. If you don’t have an iOS device like an iPad, iPhone or iPod Touch running the free iBooks app, you can still read and listen to the enhanced ePUB version of this book using the Chrome web browser on a laptop or desktop computer. Download and install the free Readium extension for Chrome, and it will let you enjoy the book in your browser. Many thanks to the contributors to the Readium project who made this possible! The following 8 minute, 43 second screencast demonstrates how you can use the Readium extension for Chrome, and also includes the audio for the entire “Our Favorite Books” enhanced eBook. Kudos to Ms. Moore and her third graders for becoming eBook authors this year! 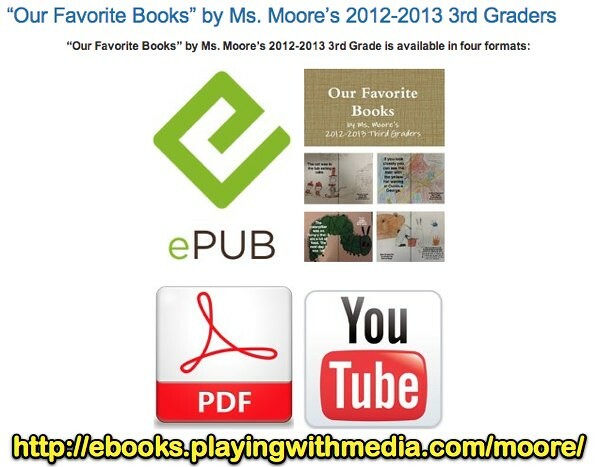 Check out other student eBook examples and submit your own on ebooks.playingwithmedia.com.